On board 777 THE PRESIDENT at 9:00 PM I am about to take dinner in the dining saloon in this 2,400-ton Presidential yacht which is a carry over from the administration of President Garcia from 1957 to 1961. It was ordered reparations at an alleged cost of five million pesos. If ordered today it will probably cost double the amount. It is the length of a destroyer and originally intended for 18 knots but it is travelling only at 15 knots, never dry-docked or serviced during the time of President Diosdado Macapagal. It had to be repaired by its original manufacturers in Japan in 1966 so that it might continue to be in operation otherwise it would have been sold for scrap iron — such a pity since it is such a beautiful ship. In twenty minutes it will be turning to the point at Surigao street as we have just come from Tandag, Surigao del Sur. either fell from the tables or broken. I returned to the ship at 3:30 o’clock in the afternoon and I went to sleep at around 4:00 p.m. It was marred by noise in the Pacific side which somehow affected my golf which I attempted to exercise at about 5:30 p.m. I went around on the face on the deck for one-half hour and practiced petty ball net for another half hour after which my usual shower and massage while I worked on some papers and documents. boat is first my nose is clogged and the doctors advised me “Do not fly while I have severe cold because any sudden changes in elevation may cause a rupture in eardrum or a return of my congestion of the inner ear and at the same time Imelda dreamt of accident in airplane because of the death of President Magsaysay at Mount Manungal on March 17, 1967. 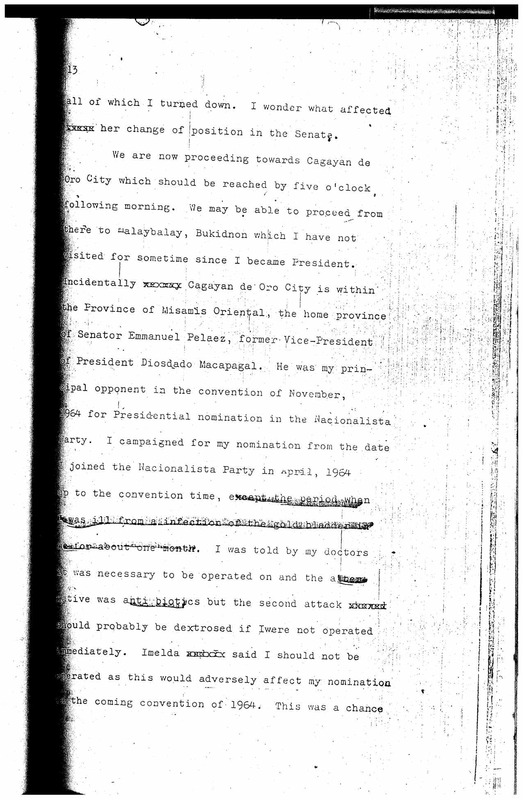 Because of the raw reports lately to the effect that the men of the Opposition candidate, Senator Sergio Osmeña, Jr., are planning a sabotage and they are after to assassinate me, she insisted that I do not take plane or helicopter any time now. And there have been on several instances of suspected sabotage of the Presidential plane — Fokker 29 — and the Presidential helicopter which crushed off Bohol made and crush landing in the water in Bohol and sunk after 40 minutes. After turning the point at Surigao del Norte and passing by the Mindanao deep at Dapa the seas have become even and quiet and the boat was quite stable. I find my visit to the provinces by ship more restive as there are none of these hurry and scunny which attend by plane. time she flew southward along the Pacific area by helicopter. I attended the lunch at the Governor’s house (Gov. Yñiguez) where I conferred with former Governor Bantug, Governor Bernardo Torres and the three LP mayors — Mayor Espina of Malitbog and the Lim brothers. At 2:30 p.m. we left Maasin and reached Olot at 9:30 in the evening. I was able to reach the guest house after a separate passage which is around 800 meters away off from the shore. The waves were quite probably about two feet high. But on the way from Maasin I went to sleep taking a short nap from 3 to 4 p.m. and to work on some papers and read some books. Same thing is true from Tandag. I was able to finish the conference at the Municipal hall at Tandag at about 2 o’clock p.m. I brought Congressman Gregorio Murillo and Congressman Constantino Navarro with Governor Modesto Castillo and Governor Sering of Surigao del Norte on board with me with some of the mayors, board members and councilors. We were finding solution for the organization of the party and the operations that we are conducting for registration of voters, and information on agricultural development. Agricultural development because we discovered in Surigao del Sur that up to now it has no irrigation system. opened a stretch of about 80 kilometers from Tandag to Leñgig, the road now having reached the last barrio of Surigao del Sur at San Roque and ready to reach Cateel of Davao at the cost of P2,600,000. For the first time the Bayabas-Kaguit and another town of South Agusan which was used to be unconnected with road are now connected by road. We are trying to finish the bridge at Gamot, Tago — the biggest voting town with the previous registered voters of more than 8,000. Tandag, the capital town, is about 5,000 only. We are also finishing a 4,000 hectares guaranteed irrigation project in Cantilan in the coast. It should be inaugurated before my birthday on Sept. 11. Four years ago in 1965 at about this time I have already finished campaigning throughout the entire Philippines but I remember that in the birthday of Imelda she had a small party going to Olot and I landed like Magellan from a small motor launch which could be brought within a meter of sandy beach and from which I jumped into the beach itself. As soon as I became President I recommended to Congress in my State of the Nation address on January 23, 1966 to limit election expenditures and period for campaigning. I recommended the period for campaigning for national offices be limited to 120 days and for local offices be limited to 90 days. 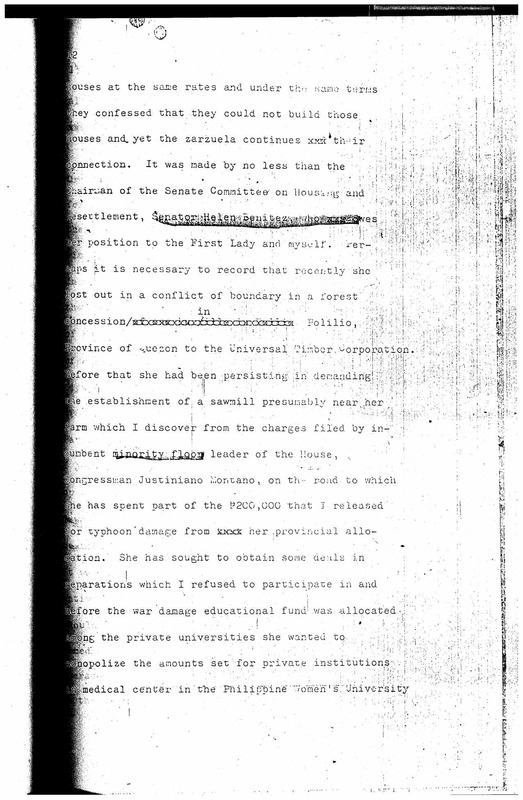 not materialized because as of now I occasionally received reports from the Laurel family including one lady, senator whom we have helped to elect from our funds and actively campaigned in 1967 elections. Senator Salvador “Doy” Laurel has an ambition someday. I gathered information he is preparing for 1973 Presidential elections to coincide with the termination of the Laurel-Langley agreement. the 16 million-dollar contract of machinery between National Housing Corporation and the Hildebrand for low cost housing was a waste of funds, because an American Corporation presumably headed by Lock had testified that he could have produced 1/32 of the cost. As J. V. Cruz said in his column – HERE AND THERE — in the Manila Times, this naive assumption by the Committee which adopted this testimony of this American firm is not totally without any reservation nor any concern about the truth and basis of his statement has questioned the integrity of such men like Chairman, Board of Directors of the Development Bank of the Philippines and most prestigious bank, the President of the Philippine National Bank, the Administrator of the Social Security System and the General Manager and Chairman of the Board of Directors of the Government Service Insurance System who were organizers of the National Housing Corporation which purchased this equipment. urban areas and 100,000 units for mostly hard hit typhoon and fire victims and squatters and low income in the labor group. made a complete study of the project from the view point of experts whom they have consulted. We have met this problem with the effort to cut red tape in the purchase of equipment. But the Panel-Lock homes succeeded in getting some __________ of a judge issuing injunction. 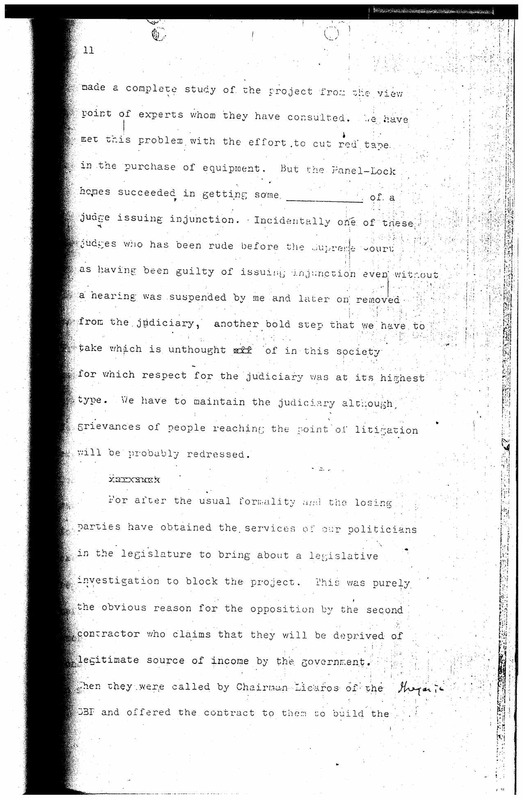 Incidentally one of these judges who has been rude before the Supreme Court as having been guilty of issuing injunction even without a hearing was suspended by me and later on removed from the judiciary, another bold step that we have to take which is unthought of in this society for which respect for the judiciary was at its highest type. We have to maintain the judiciary although grievances of people reaching the point of litigation will be probably redressed. all of which I turned down. I wonder what affected her change of position in the Senate. that had to be taken and had to limit my diet to almost no meat and oil whatsoever. I had the gall bladder removed in January, 1967 immediately after my State of the Nation Address on January 23, 1967 when I suffered pains and several attacks before the Joint Session of Congress. Dr. Sison, my attending physician, at the time thought that the campaign was….. The Presidential yacht is No. 777, the number of votes, that made me win the convention of 1964 as against Senator Emmanuel Pelaez who received 444 votes, in the second balloting in the convention. 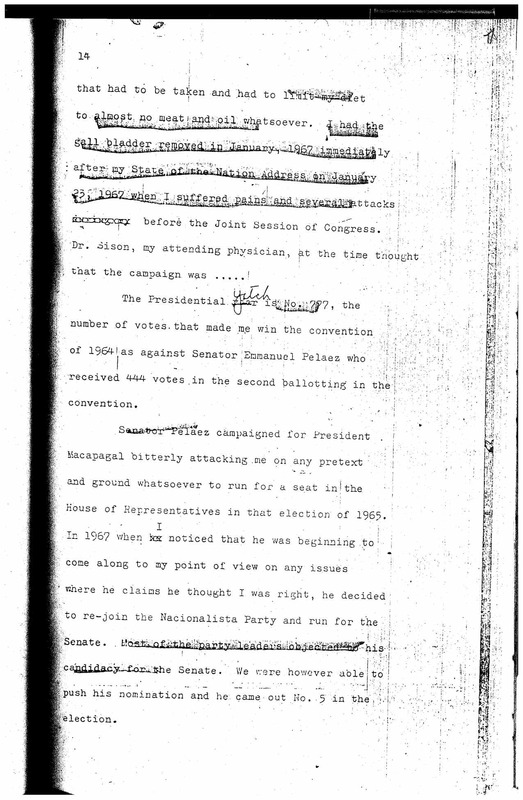 Senator Pelaez campaigned for President Macapagal bitterly attacking me on any pretext and ground whatsoever to run for a seat in the House of Representatives in that election of 1965. In 1967 when I noticed that he was beginning to come along to my point of view on any issues where he claims he thought I was right, he decided to re-join the Nacionalista Party and run for the Senate. Most of the party leaders objected to his candidacy for the Senate. We were however able to push his nomination and he came out No. 5 in the election.